Impact index factor h=30 and total number of citations of more than 2,600 (on August 2018 according to ADS NASA). 17 first author papers. Quenching timescales of galaxies in the EAGLE simulations. Wright, Ruby J.; Lagos, Claudia del P.; Davies, Luke J. M.; Power, Chris; Trayford, James W.; Wong, O. Ivy, 2018, submitted to MNRAS. Galaxy formation in the Planck Millennium: the atomic hydrogen content of dark matter halos. Baugh, C. M.; Gonzalez-Perez, Violeta; Lagos, Claudia D. P.; Lacey, Cedric G.; Helly, John; Jenkins, Adrian; Frenk, Carlos S.; Benson, Andrew; Bower, Richard; Cole, Shaun, 2018, submitted to MNRAS. Dynamic equilibrium sets atomic content of galaxies across cosmic time. Wang, Liang; Obreschkow, Danail; Lagos, Claudia D. P.; Sweet, Sarah M.; Fisher, Deanne B.; Glazebrook, Karl; Maccio, Andrea V.; Dutton, Aaron A.; Kang, Xi, 2018, submitted to ApJ. The evolution of the UV-to-mm extragalactic background light: evidence for a top-heavy initial mass function?. Cowley, William. I.; Lacey, Cedric G.; Baugh, Carlton M.; Cole, Shaun; Frenk, Carlos S.; Lagos, Claudia del P., 2018, submitted to MNRAS. Shark: introducing an open source, free and flexible semi-analytic model of galaxy formation. Lagos, Claudia del P.; Tobar, Rodrigo J.; Robotham, Aaron S. G.; Obreschkow, Danail; Mitchell, Peter D.; Power, Chris; Elahi, Pascal J., 2018, submitted to MNRAS. 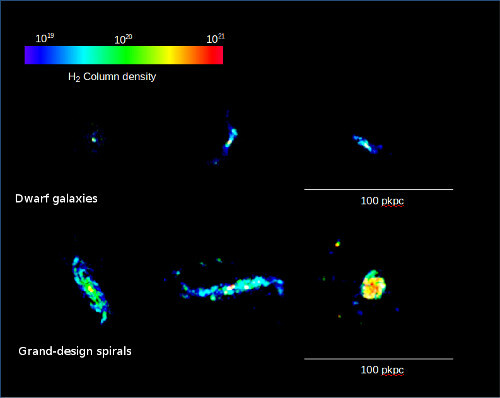 Ring Galaxies in the EAGLE Hydrodynamical Simulations. Ahmed Elagali, Claudia D. P. Lagos, O. Ivy Wong, Lister Staveley-Smith, James W. Trayford, Matthieu Schaller, Tiantian Yuan, Mario G. Abadi, 2018, submitted to MNRAS. Distant monsters: high redshift AGN predictions from a LCDM cosmological model. Griffin, Andrew J.; Lacey, Cedric G.; Gonzalez-Perez, Violeta; Lagos, Claudia del P.; Baugh, Carlton M.; Fanidakis, Nikos, 2018, submitted to MNRAS. Ghost busting: introducing a new, robust galaxy finder algorithm for simulations. Canas, Rodrigo; Elahi, Pascal J.; Welker, Charlotte; Lagos, Claudia del P.; Power, Chris; Dubois, Yohan; Pichon, Christophe, 2018, submitted to MNRAS. Connecting and dissecting galaxies' angular momenta and neutral gas in a hierarchical universe: cue DARK SAGE. Stevens, Adam R. H.; Lagos, Claudia del P.; Obreschkow, Danail; Sinha, Manodeep, 2018, submitted to MNRAS. Deep Extragalactic VIsible Legacy Survey (DEVILS): Motivation, Design and Target Catalogue. Davies, L. J. M.; Robotham, A. S. G.; Driver, S. P.; Lagos, C. P.; et al, 2018, MNRAS in press. The oxygen abundance gradients in the gas discs of galaxies in the EAGLE simulation. Tissera, Patricia B.; Rosas-Guevara, Yetli; Bower, Richard G.; Crain, Robert A.; Lagos, Claudia del P.; Schaller, Matthieu; Schaye, Joop; Theuns, Tom, 2018, submitted to MNRAS. Modeling the atomic-to-molecular transition in cosmological simulations of galaxy formation. Diemer, Benedikt; Stevens, Adam R. H.; Forbes, John C.; Marinacci, Federico; Hernquist, Lars; Lagos, Claudia del P.; Sternberg, Amiel; Pillepich, Annalisa; Nelson, Dylan; Popping, Gergö; Villaescusa-Navarro, Francisco; Torrey, Paul; Vogelsberger, Mark, 2018, submitted to ApJ. Molecular Gas Contents and Scaling Relations for Massive Passive Galaxies at Intermediate Redshifts from the LEGA-C Survey. Justin Spilker, Rachel Bezanson, Ivana Barisic, Eric Bell, Claudia del P. Lagos, Michael Maseda, Adam Muzzin, Camilla Pacifici, David Sobral, Caroline Straatman, Arjen van der Wel, Pieter van Dokkum, Benjamin Weiner, Katherine Whitaker, Christina C. Williams, Po-Feng Wu, 2018, ApJ in press. The disk averaged star formation relation for Local Volume dwarf galaxies. Lopez-Sanchez, A. R.; Lagos, C. D. P.; Young, T.; Jerjen, H., 2018, MNRAS in press. The connection between mass, environment, and slow rotation in simulated galaxies. Lagos, Claudia del P.; Schaye, Joop; Bahé, Yannick; Van de Sande, Jesse; Kay, Scott T.; Barnes, David; Davis, Timothy A.; Dalla Vecchia, Claudio, 2018, MNRAS, 476, 4327. Revisiting the stellar mass -- angular momentum -- morphology relation: extension to higher bulge fraction, and the effect of bulge type. Sweet, Sarah M.; Fisher, David; Glazebrook, Karl; Obreschkow, Danail; Lagos, Claudia; Wang, Liang, 2018, ApJ in pres. Star formation in the outskirts of DDO 154: A top-light IMF in a nearly dormant disc. Watts, Adam B.; Meurer, Gerhardt R.; Lagos, Claudia D. P.; Bruzzese, Sarah M.; Kroupa, Pavel; Jerabkova, Tereza, 2018, MNRAS in press. Using Velocity Dispersion to Estimate Halo Mass: Is the Local Group in Tension with ΛCDM?. Elahi, Pascal J.; Power, Chris; Lagos, Claudia del P.; Poulton, Rhys; Robotham, Aaron S. G., 2018, MNRAS. SURFS: Riding the waves with Synthetic UniveRses For Surveys. Elahi, Pascal J.; Welker, Charlotte; Power, Chris; Lagos, Claudia del P.; Robotham, Aaron S. G.; Cañas, Rodrigo; Poulton, Rhys, 2018, MNRAS, 475.5338E. Modelling the cosmic spectral energy distribution and extragalactic background light over all time. Stephen K. Andrews, Simon P. Driver, Luke J. Davies, Claudia d. P. Lagos, Aaron S. G. Robotham, 2017, MNRAS in press. Very compact millimeter sizes for composite star-forming/AGN submillimeter galaxies. Ikarashi, Soh; Caputi, Karina; Ohta, Kouji; Ivison, R. J.; Lagos, Claudia D. P.; et al., 2017, ApJ in press. GAMA/G10-COSMOS/3D-HST: The 0-z-5 cosmic star-formation history, stellar- and dust-mass densities. Driver, Simon P.; Andrews, Stephen K.; da Cunha, Elisabete; Davies, Luke J.; Lagos, Claudia; et al., 2017, MNRAS in press. Comparing galaxy formation in semi-analytic models and hydrodynamical simulations. Mitchell, Peter D.; Lacey, Cedric G.; Lagos, Claudia D. P.; Frenk, Carlos S.; Bower, Richard G.; Cole, Shaun; Helly, John C.; Schaller, Matthieu; Gonzalez-Perez, Violeta; Theuns, Tom, 2017, MNRAS in press. The Baryonic Collapse Efficiency of Galaxy Groups in the RESOLVE and ECO Surveys. Eckert, Kathleen D.; Kannappan, Sheila J.; Lagos, Claudia del P.; Baker, Ashley D.; Berlind, Andreas A.; Stark, David V.; Moffett, Amanda J.; Nasipak, Zachary; Norris, Mark A., 2017, ApJ in press. Measuring the growth rate of structure with Type IA Supernovae from LSST. Howlett, Cullan; Robotham, Aaron S. G.; Lagos, Claudia D. P.; Kim, Alex G., 2017, ApJ in press. The Local Volume HI Survey: star formation properties. Wang, Jing; Koribalski, Baerbel S.; Jarrett, Tom H.; Kamphuis, Peter; Li, Zhao-Yu; Ho, Luis C.; Westmeier, Tobias; Shao, Li; Lagos, Claudia del P.; Wong, O. Ivy; Serra, Paolo; Staveley-Smith, Lister; Jozsa, Gyula; van der Hulst, Thijs; Lopez-Sanchez, A. R., 2017, MNRAS in press. The evolution of the star formation rate function in the EAGLE simulations: A comparison with UV, IR and Hα observations from z ~ 8 to z ~ 0. A. Katsianis, G. Blanc, C. P. Lagos, N. Tejos, R. G. Bower, A. Alavi, V. Gonzalez, T. Theuns, M. Schaller, S. Lopez, 2017, MNRAS in press. The Taipan Galaxy Survey: Scientific Goals and Observing Strategy. Elisabete da Cunha, Andrew M. Hopkins, Matthew Colless, Edward N. Taylor, Chris Blake, Cullan Howlett, Christina Magoulas, John R. Lucey, Claudia Lagos, et al., 2017, PASA. Angular momentum evolution in Dark Matter haloes: a study of the Bolshoi and Millennium simulations. Contreras, S.; Padilla, N.; Lagos, C. D. P., 2017, MNRAS in press. The VLA-COSMOS 3~GHz Large Project: AGN and host-galaxy properties out to z$\lesssim$6. Delvecchio, I.; Smolcic, V.; Zamorani, G.; Lagos, C. Del P.; Berta, S.; Delhaize, J.; Baran, N.; Rosario, D. J.; Gonzalez-Perez, V.; Ilbert, O.; et al., 2017 ApJ in press. Quantifying the impact of mergers on the angular momentum of simulated galaxies. Lagos, Claudia del P.; Stevens, Adam R. H.; Bower, Richard G.; Davis, Timothy A.; Contreras, Sergio; Padilla, Nelson D.; Obreschkow, Danail; Croton, Darren; Trayford, James W.; Welker, Charlotte; Theuns, Tom, 2017, MNRAS in press. Angular momentum evolution of galaxies over the past 10-Gyr: A MUSE and KMOS dynamical survey of 400 star-forming galaxies from z=0.3-1.7. Swinbank, Mark; Harrison, Chris; Trayford, James; Schaller, Matthieu; Smail, Ian; Schaye, Joop; Theuns, Tom; Smit, Renske; Alexander, David; Bacon, Roland; Bower, Richard; Contini, Thierry; Crain, Rob; de Breuck, Carlos; Decarli, Roberto; Epinat, Benoit; Fumagalli, Michele; Furlong, Michelle; Galametz, Audrey; Johnson, Helen; Lagos, Claudia; Richard, Johan; Vernet, Joel; Sharples, Ray; Sobral, David; Stott, John, 2017, MNRAS in press. Extremely Red Submillimeter Galaxies: New z>~4-6 Candidates Discovered using ALMA and Jansky VLA. Ikarashi, Soh; Ivison, R. J.; Caputi, Karina I.; Nakanishi, Koichiro; Lagos, Claudia D. P.; Ashby, M. L. N.; Aretxaga, Itziar; Dunlop, James S.; Hatsukade, Bunyo; Hughes, David H.; Iono, Daisuke; Izumi, Takuma; Kawabe, Ryohei; Kohno, Kotaro; Motohara, Kentaro; Ohta, Kouji; Tamura, Yoichi; Umehata, Hideki; Wilson, Grant W.; Yabe, Kiyoto; Yun, Min S., 2017, ApJ in press. Cold gas stripping in satellite galaxies: from pairs to clusters. Brown, Toby; Catinella, Barbara; Cortese, Luca; Lagos, Claudia del P.; Dave, Romeel; Kilborn, Virginia; Haynes, Martha P.; Giovanelli, Riccardo; Rafieferantsoa, Mika, 2017, MNRAS, 466, 1275B. On the frequency of star-forming galaxies in the vicinity of powerful AGNs: The case of SMM J04135+10277. Judit Fogasy, Kirsten Knudsen, Claudia del P. Lagos, Guillaume Drouart, Violeta Gonzalez-Perez, 2017, A\&A, 597A, 123F. Angular momentum evolution of galaxies in EAGLE. Claudia del P. Lagos, Tom Theuns, Adam R.H. Stevens, Luca Cortese, Nelson D. Padilla, Timothy A. Davis, Sergio Contreras, Darren Croton, 2017, MNRAS, 464, 3850L. Galaxy And Mass Assembly (GAMA): The absence of stellar mass segregation in galaxy groups and consistent predictions from GALFORM and EAGLE simulations. P. R. Kafle, A. S. G. Robotham, C. del P. Lagos, L. J. Davies, A. J. Moffett, S. P. Driver, S. K. Andrews, I. K. Baldry, J. Bland-Hawthorn, S. Brough, L. Cortese, M. J. Drinkwater, R. Finnegan, A. M. Hopkins, J. Loveday, 2016, MNRAS, 463, 4194K. Baryon effects on void statistics in the EAGLE simulation. Enrique Paillas, Claudia D.P. Lagos, Nelson Padilla, Patricia Tissera, John Helly, Matthieu Schaller, 2017, MNRAS, 470, 4434P. How to get cool in the heat: comparing analytic models of halo gas cooling with EAGLE. Stevens, Adam R. H.; Lagos, Claudia del P.; Contreras, Sergio; Croton, Darren J.; Padilla, Nelson D.; Schaller, Matthieu; Schaye, Joop; Theuns, Tom, 2017, MNRAS, 467, 2066S. The distribution of atomic hydrogen in EAGLE galaxies: morphologies, profiles, and HI holes. Bahe, Yannick M.; Crain, Robert A.; Kauffmann, Guinevere; Bower, Richard G.; Schaye, Joop; Furlong, Michelle; Lagos, Claudia; Schaller, Matthieu; Trayford, James W.; Dalla Vecchia, Claudio; Theuns, Tom, 2015, MNRAS in press. The initial mass function and star formation law in the outer disc of NGC 2915. Bruzzese S., Meurer G., Lagos C., Elson E., Werk J., Blakeslee J., Ford H., 2015, MNRAS, 447, 622B. 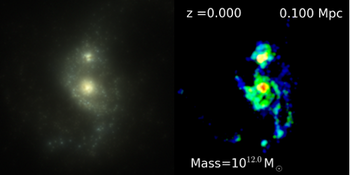 Compact starbursts in z~3-6 submillimeter galaxies revealed by ALMA. Ikarashi S., Ivison R., Caputi K., Aretxaga I., Dunlop J., Hatsukade B., Hughes D., Iono D., Izumi T., Kawabe R., Kohn K., Lagos C., Motohara K., Nakanishi K., Ohta K., Tamura Y., Umehata H., Wilson G., Yabe K., Yun M., 2014, ApJ letters submitted. The origin of the atomic and molecular gas contents of early-type galaxies. II. Misaligned gas accretion. Lagos C., Padilla N., Davis T., Lacey C., Baugh C., Gonzalez-Perez V., Zwaan M., Contreras S., 2014, MNRAS in press. The evolution of AGN across cosmic time: what is downsizing?. Fanidakis N., Baugh C., Benson A., Bower R., Cole S., Done C., Frenk C., Hickox R., Lacey C., Lagos C., 2012, MNRAS, 419, 2797. Cosmic evolution of the atomic and molecular gas content of galaxies. Lagos C., Baugh C., Lacey C., Kim H.-S., Power C., 2011, MNRAS, 418, 1649. On the impact of empirical and theoretical star formation laws on galaxy formation. Lagos C., Lacey C., Baugh C., Bower R., Benson A., 2011, MNRAS, 416, 1566. On the Evolution of the Molecular Gas Fraction of Star-Forming Galaxies. Geach J., Smail I., Moran S., MacArthur L., Lagos C., Edge A., 2011, ApJ, 730, 19. Host galaxy-active galactic nucleus alignments in the Sloan Digital Sky Survey Data Release 7. Lagos C., Padilla N., Strauss M., Cora S., Hao L., 2011, MNRAS, 414, 2148. Ram pressure stripping in a galaxy formation model - I. A novel numerical approach. Tecce T., Cora S., Tissera P., Abadi M., Lagos C., 2010, MNRAS, 408, 2008. Cosmic queuing: galaxy satellites, building blocks and the hierarchical clustering paradigm. Lagos C., Padilla N., Cora S., 2009, MNRAS, 397, 31. Black hole spin and radio loudness in a Λ cold dark matter universe. Lagos C., Padilla N., Cora S., 2009, MNRAS, 395, 625. Effects of AGN feedback on ΛCDM galaxies. Lagos C., Cora S., Padilla N., 2008, MNRAS, 388, 587. Simulations and modelling of the ISM in galaxies. Lagos C., Baugh C., Lacey C., 2012.